I'm thinking about adopting this little cutie. Any suggestions of what he may be? My first thought was a Min Pin mix. He is 8 weeks old and 4 lbs. He could be mixed with a terrier. 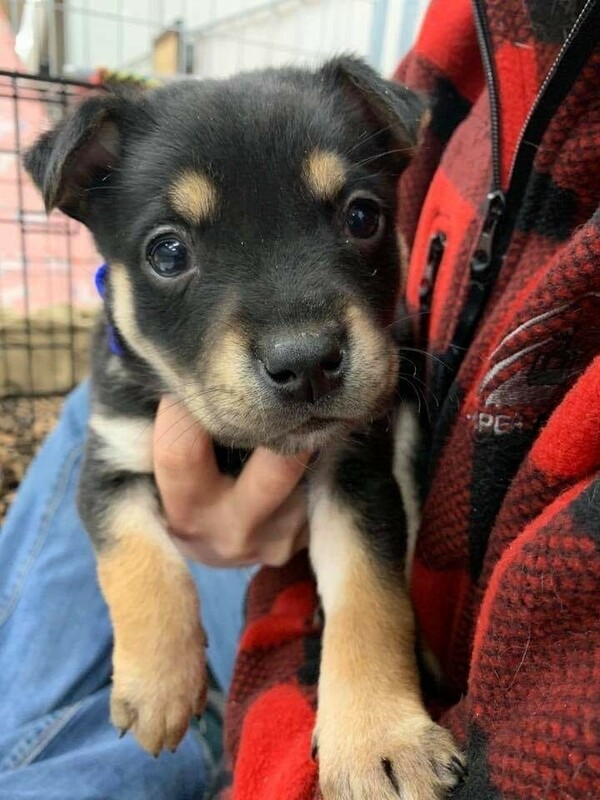 He looks like a terrier/shepherd mix. What a sweetie!! What does the body and the hip line look like? Min pins have really high, thin back hip lines. The paws look big for a min pin. There could be a little Chihuahua in the ears and maybe even a drop of beagle in the snout. Perhaps if you show this to a vet, including a photos showing the legs, back and hips, he/she can give you their best guess. Boy, if our Clarence would tolerate a sib, I would snap him up in a second. That face is just precious! Post back what you decide! He looks like part Rottie to me. Super cute! Could also be Pinscher as you say. At that age they're all very small so it's hard to say how big he will get. His true features and size may not be apparent at this young age. Do you not have any information on his parents? Even one of parents would help with identifying him. Maybe wait a few weeks and try your question again as there are some very good "dog" people on this site that will be able to help you. Post back later with some new pictures. More important than his ID is that if you adopt him, get him started right away with a good vet so he can start his first year of shots/vaccinations that are so important to keeping him healthy (and alive). Here is a link to a schedule so be sure he starts his Parvo shots. If you really want to know more about his breeding then you can purchase a DNA test kit that would tell you a lot about his past relatives.